Many men (sorry guys) have high expectations of marriage. They expect a woman who appears and acts like the 50's housewife of his dreams. Today, that vision just isn't realistic. The Feminist Movement has come too far for women to be perpetually fulfilling these unrealistic expectations. When millennials' grandparents got married it was quickly assumed that the man would work while the wife would stay at home and tend to all things "womanly": cooking, cleaning, etc. In the modern century, however, many wives don't have the option of staying home. Men and women are paired with the burden of providing for their families. In these instances, it would be cruel and unusual punishment for a woman to take on two roles (full-time business woman and housewife) while the man got to saddle back with his one role and relax the moment his feet hit the threshold of the home. At least this is the burden for many women. They feel crushed by their husbands expectations and their responsibilities as part provider and part homemaker. Personally, I think gender stereotypes in marriage have been blurred a bit since the 1950's, but I still find many of them successful in my home. Here's why... I enjoy doing all of those "womanly" things. I enjoy serving my husband by providing him with a hot meal almost every night. I enjoy serving myself as well as our husband by having a clean and tidy home. 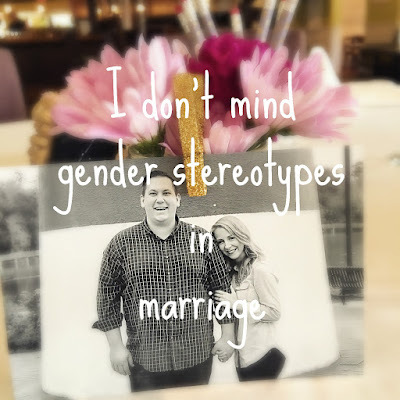 But gender stereotypes don't just set a standard for me, they set a standard for my husband as well. I like that my husband takes care of our finances, especially investments. I like that my husband fills both of our cars with gas (even when I'm the one driving). Gender stereotypes actually serve my marriage instead of belittle it. Granted my husband and I share many duties as well. He loves to cook, so he will often take on the challenge of making a new recipe or cook when he knows I've had a long day. My husband is one of those rarities that enjoys doing the dishes, so by God I let him half the time. There are a few things that we trade off on, but overall I enjoy serving my husband in the home, and I'm so thankful that he serves me by being the primary provider for our family. Obviously, this approach does not work for everyone. Many women are the primary breadwinners today, or they simply hate the mundane tasks of the home. I'm sure many women are also more educated than I am about the advantages and disadvantages of mutual funds. I think husbands and wives have to discuss what works best for them BEFORE getting married. I knew my husbands expectations by the time of our engagement, and we made big decisions as to who would handle which responsibilities. Above all else, marriage is about compromise. Find what works best for your family and adapt. I agree with your opinion. I don't think so women supposed to be only stay in home and do housework. Many women nowadays are busy with their jobs/career, but they still do housework.